vote for Louis: choice male artist! 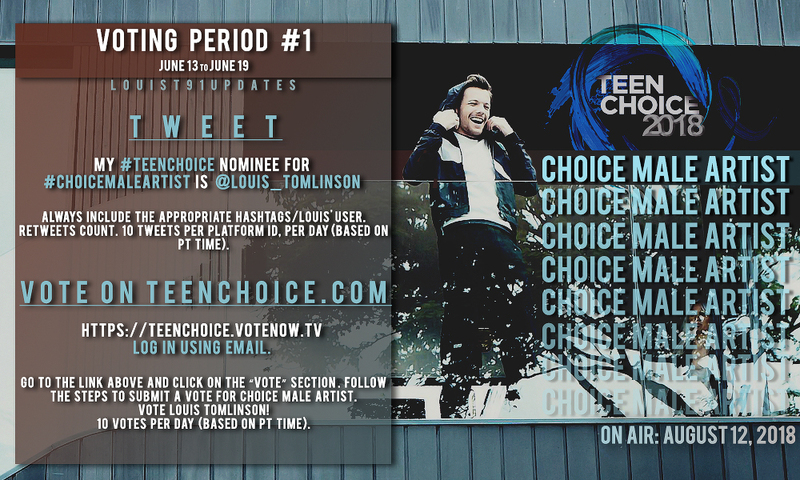 Louis Tomlinson has been nominated for Choice Male Artist in the 2018 Teen Choice Awards. The TCAs are an annual awards show that airs on the Fox television network, honoring the year's biggest achievements in categories such as music, film, sports, television, and is voted by viewers. The awards show will air on August 12, 2018. VOTING PERIOD: JUNE 13 (9am PT) - JUNE 19, 2018 (9am pt). Login using your Facebook account or an email address. Scroll down the list of categories until you find Choice Male Artist Music. Click 'Vote' under Louis' name. Vote 10 times (a message will be displayed on screen when you have reached your limit for the day).